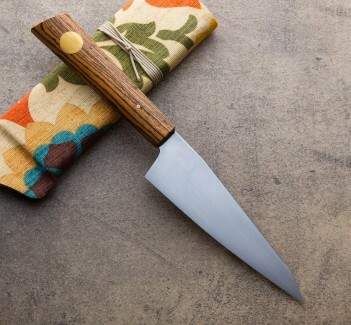 Designed by bladesmith Don Carlos Andrade as the ultimate midsize knife in any kitchen, the EDK is a capable and versatile workhorse in a compact package. 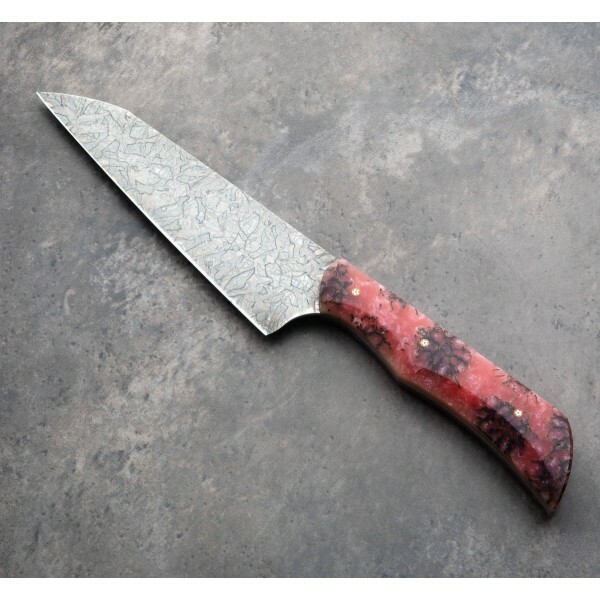 This head-turning rendition features a 1095 carbon blade with distal taper, convex grind and forced mustard patina. 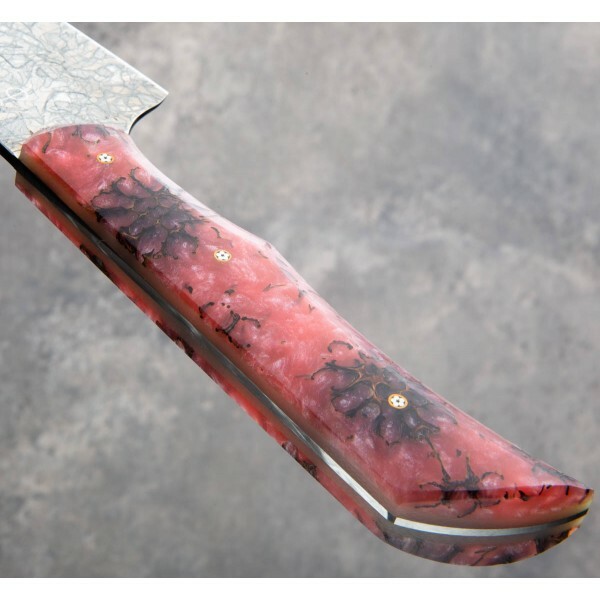 And we haven't even gotten to the handle, shaped from red sweet gum pod cast resin with translucent G10 liners and three matching mosaic pins. A cloth-covered protective case is included. Working from his small shop in Southern California, Don Carlos Andrade designs and creates heirloom quality chef knives by hand, each with a unique and inviting look and feel that stands out from the crowd. 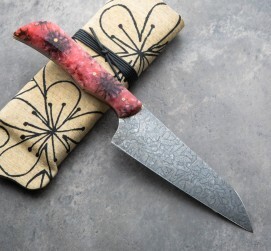 A trained chef and long-time artist with a background in stone sculpting and blacksmithing, Don's attention to detail as well as his knowledge of the subtleties involved in working with kitchen tools day in and day out result in extraordinary, custom chef knives that will last generations of daily use.  Blade length: 135mm / 5.3". Overall length: 265mm / 10.4". Blade width at choil: 3.2mm. Blade wiidth 1" from tip: 1.6mm. Blade height at heel: 41mm. Weight: 5.4oz / 154g. 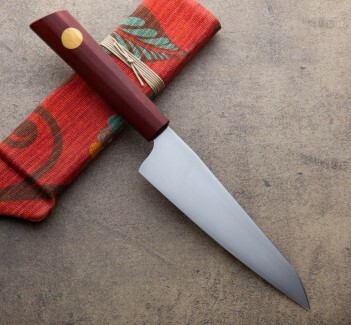 Blade: 1095 carbon steel with forced mustard patina. 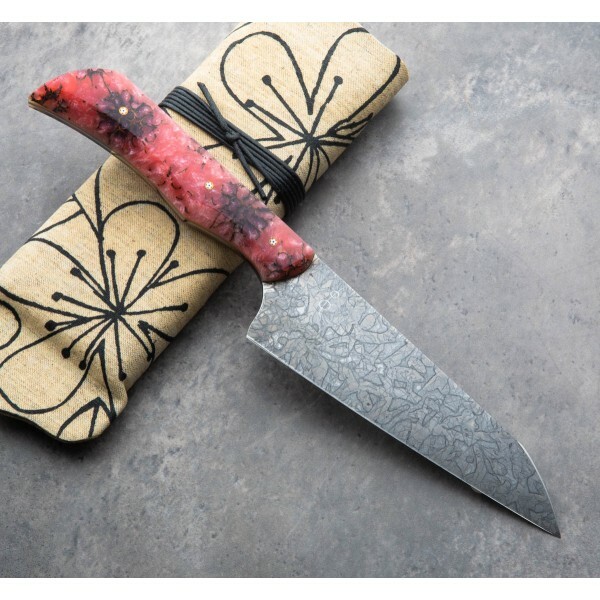 Handle: Red sweet gum cast in resin with three mosaic pins.